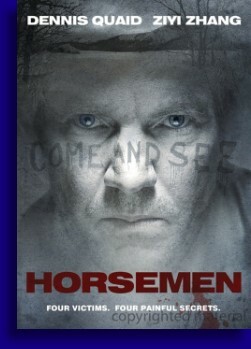 I’m going to tell you right off that bat this movie ‘Horsemen’ almost made no logical sense and possessed plot holes so gapingly large that I’m not even sure if they were actually plot holes or simply large scenes that were just flat edited out the movie. These issues was exacerbated by the fact that I watched this movie with my wife, a woman who will ask me questions about a movie that makes complete and total sense, so imagine my extra long evening attempting to explain this one to her when I myself didn’t know what the hell was going on. Remember the scene in ‘Naked Gun’ when Frank Drebin, while searching Ricardo Montalban’s office yells ‘Bingo!’ and then pulls out a bingo card? My wife asks me ‘Why was that supposed to funny?’ Try explaining that to somebody and see how it fares for you. ‘Horsemen’ opens with an old dude walking his mutt in the snow when he stumbles across a rather uniquely set up bloody mess of a scene that probably should’ve prompted my man to call the cops immediately. He doesn’t. What my man finds is a bunch of extracted teeth but alas there’s no body nearby any of these teeth. Note that this find does summon like the only orthodontic detective in the vicinity, one Aiden Breslin, who is now on the case. A tooth detective. Who knew such a thing even existed? Breslin (Dennis Quaid) tells us all kinds of things about the cat these teeth belonged to and no sooner than he’s finished his conversation, his partner Stingray (Clifton Collins Jr.) calls him up with yet another gruesome discovery. Stingray. Mind you we never find out if the man’s name is Ray Stingley or if he’s a fan of The Police or he just likes murderous underwater sea creatures. Just Stingray. Anyway Breslin and Stingray find this dead woman suspended on hooks and bled dry in her upstairs townhouse with her kids downstairs. One of these children would be her adopted super cute Chinese daughter Kristin (Ziyi Zhang) whose English has gotten MUCH better since ‘Rush Hour 2’ but probably isn’t as good as one would expect from a grown woman whose been under the care of wealthy suburban white people since she was 8 years old. Detective Breslin has his own issues he’s been dealing with since his was widowed a few years ago. His selfish dead wife left him to deal with a precocious eight year old named Sean (Liam James) and pouty teenager Alex (Lou Taylor Pucci) who just wants daddy’s love. Delivering this much desired love is becoming increasingly difficult because the bodies are piling up and they’re piling up to the tune of Revelations and the four horsemen of the Apocalypse. Complicating matters are the fact that the super cute Chinese daughter has stopped being cute and has turned into a low-rent version of that chick from Miike’s ‘Audition’. What all this is boiling down to is our earth shattering, mind bending ‘twist’ of a conclusion. At least in theory. Taking in consideration that I’m not the brightest bulb in the box and I cracked the case in the first ten or so minutes I’m thinking our esteemed tooth detective should’ve done the same. Jonas Ackerlund’s ‘Horsemen’, at least starting out, looked like it had all of the necessary ingredients be, at the very least, a solid spooky trip. We have a veteran actor in D. Quaid who rarely disappoints, a veteran actress in the lovely Miss Zhang doing her darndest to play the freaky Asian kid at the tender age of thirty, and not to mention another fine veteran actor in Clifton Collins Jr. saddled with the role of playing the minority sidekick in a horror movie. I don’t want to spoil it for you but this character rarely makes it out the front door alive. Toss in a nice ominous atmosphere to place these above average ingredients, and on paper we should have a winner. But alas it was not to be. Without knowing for sure I’m going to guess that this flick was essentially lost in the editing room. Running at a bit over 80 minutes it appeared to my untrained eye that huge chunks of the movie were simply missing, which is the only way I can think to explain the rather large amounts of incoherence that filled this thing. At first it was looking like a supernatural style thriller with the mysterious glitches in electronic equipment and whatnot, then it we had elements of a saw rip-off which subsequently dissolved into a’Se7en’ rip-off and basically culminated into the kids from ‘The Breakfast Club’ behaving really, really badly. Plot elements are picked up and then dropped, numerous scenes seemed disjointed and didn’t flow with the films flow, and once we get to the explosive conclusion you are left with more questions than answers as to how our orchestrators managed to pull any of this off without arousing even the slightest bit of suspicion. You can probably thank CSI for this but screenwriters really have to be on top of their game in devising these complex schemes if they want the audience to wholly believe in the characters they create and these overly complex crimes they are attempting to commit. ‘Horsemen’ had some solid elements leading to what we were hoping was going to be a solid film, but this is one that looks like it needs a directors cut or something to replace the gaping holes that I figure were left on the cutting room floor. Of course this also just might make the film longer and more nonsensical and I don’t think anybody really wants to see that.